I'm not suggesting that director F.W. Murnau had, himself, entered a Faustian pact with some soul-scrounging demonic pawn broker in exchange for cinematic prowess, but, damn was he fantastic. Just four years after immortalizing the undead in 1922's NOSFERATU, Murnau tackled an even better known, and much older, story of mortal man's perpetual cage match with the forces of darkness. In FAUST, however, the dark, poisoned heart that thumps ripe for the staking is the same one that fuels the story's protagonist: the heart of man. With bombastic special effects and a masterful ability to capture the dramatic spectacle of myth at both ends of its scope - the achingly human and the magically sublime - Murnau's FAUST is not just a powerful film, but also a definitive telling of one of mankind's most enduring and inescapable tragedies, a story of human greed and the lengths a person will go to indulge his hunger for power. After watching Murnau's film, the one thing my admittedly schlubby and pop culture-logged brain keeps returning to is the use of visual effects, and not just the splice-and-lenses nitty gritty, but the grand-scale malevolence, heartbreak and, at times, grace, the techniques successfully capture. A traditional German folktale, immortalized in chapbooks, plays and, most famously, Goethe's epic poem, the story of Faust is an ideal candidate for filmic retelling - particularly as a silent - due to its classic imagery of good an evil as filtered through Western archetypes of heaven and hell, its straightforward story, and the opportunity to visualize some just out-and-out rad stuff, like demons and plagues and pure redeeming love. And Murnau takes full advantage, pushing the boundaries of then-available effects technology to create still-impressive scenes of apocalyptic horsemen thundering across tumultuous skies; of radiant angelic guardians; of alchemical conjuring spells; and of the demon Mephisto, who, in one particularly fantastic and unsettling scene, is shown towering over Faust's village, his massive, ebon wings encircling the town. Of course, the experience of FAUST's visual richness is enhanced by the fact that the story is not only straightforward, but also familiar, so even those unaccustomed to watching silent or foreign films can easily get lost in the sheer cinematic wonder without worrying too much that they've missed an important narrative reveal. 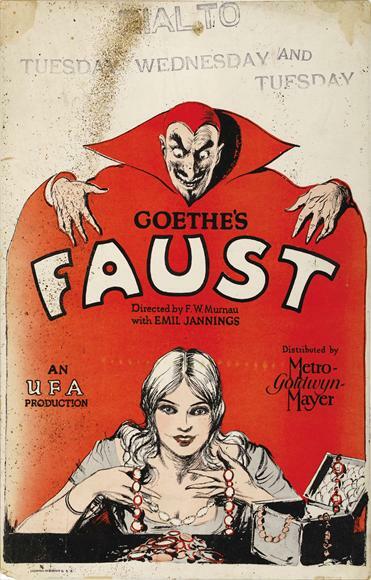 Murnau's adaptation, scripted by Hans Kyser, foregoes the earliest versions of Faust, where the high-minded protagonist seals a hellish deal out of boredom and greed, for a later, and slightly more nuanced, iteration where Faust (played here by Gösta Ekman) only contemplates the damning transaction when Mephisto (Emil Jannings) offers him the ability to heal plague-stricken villagers, who are perishing by the baker's dozen. The film's first half plays out Faust's reluctance to enter the bargain, his eventual hedonistic fall to the temptations of power, lust, and the return of his youth, and, finally, his sad realization that, having experienced the entire spectrum of terrestrial adventure and earthly debauchery, all he really wants is to go back to his childhood home. This movie makes you think that silent film must have been around in the 1300s or so; Murnau's vision really looks like something that bubbled up from the medieval era, not remotely 20th century. Well, except for the happy ending. [Spoiler Alert] Mephisto is defeated by a woman's unconditional love - how very focus group. These days she'd stand in line behind the Devil to get her piece of his soul (and, if applicable, US citizenship) in the divorce settlement. Mel Gibson will back me up on this.